Readers: A few years ago, in my very first blogging attempt, I developed a blog called #singlegirlproblems where I detailed my chronically single life. I didn't do a lot with it -- really only a few entries and about a dozen started but never finished entries. My first Heather's Heart to Heart post was INCREDIBLY well received by you guys. I got more traffic on the blog than I ever had and I got comments, emails, and tweets about it. So in sharing bits of myself with you that are not book related, I thought I'd bring to you some of my entries from #singlegirlproblems and maybe even do a few new ones and finish some of the ones that I'd left untouched. I hope you enjoy them and please, laugh at my expense. They're mostly funny! I once dislocated my shoulder trying to get a bag of waffles out of the freezer. They were your average, ordinary, run of the mill Eggo Waffles, the kind my parents bought in bulk at Costco for me and my brother while we were growing up at home. We had a lifetime supply of them stored in all three of the freezers in our house. There was nothing special about these waffles. They weren’t strangely heavy. There wasn’t an unusual amount of freezer burn or ice to contribute to the weight. The only strange and special thing about the situation was me. I didn’t mean to intrude upon the waffles or entice them. I actually wanted nothing to do with the waffles at all – I was searching for bagels, an entirely different breakfast food. I’d stacked several packages of the waffles on the side of the chest freezer in search of them. Once found, I set them aside and, moving quickly, accidentally knocked one package of waffles off the side of the freezer and down the side of it, stuck between the chest and the wall. Without thinking, I reached down the side of the freezer – a good three feet or so – to try to reach the package. It was just out of my grip when I thought to myself I’m a dancer, I’m limber and flexible, I can make my stretchy arm go two more inches. It turns out I was right; it would go there, but it wouldn’t necessarily come back. I had just clasped my fingers around the package victoriously when I got stuck. At first I thought that maybe this was just like when my hip got popped out of socket at the barre in ballet. I could just wiggle it a little and maybe it would slide back in. Naturally, my theory failed me when I realized that I really couldn’t move much at all. Any attempt at motion elsewhere in my upper body caused pain that radiated all the way down my spine. After several attempts at getting unstuck from the awkward position – half bent over an open chest freezer with packages of waffles every where and my right arm extended all the way down the side of the chest freezer – I started calling for help. Did I mention we keep this chest freezer in our basement? In the noisiest area of the house. Because it’s where we keep the washer and dryer. Which were both on and running loudly at the time. As I waited for help to come, I remembered a commercial for those necklaces that senior citizens where to press a button if they’ve fallen and can’t get up and thinking that it might not be a bad idea for me to spring for one of those. When my parents finally heard and rescued me, it took both of them to carefully help me straighten up without pain. The trick was that the side of the freezer was blocked by a little shelf, which is why I hadn’t just knelt down to get them in the first place. The first thing my dad did was to move this bookshelf and clearly illustrate that it was on wheels and I could’ve saved myself all of this trouble if I had better analyzed the situation. Thanks, Dad, I thought. That really kills the pain and makes me feel a whole lot better about this situation. I was late on a Sunday night and the next day was Martin Luther King Jr. Day. At that point in time, I was still terrified of hospitals and wanted nothing to do with spending all night in the ER. My mom gave me a couple of ibuprofen and a muscle relaxer with the hope that overnight, my arm might settle back into the socket. But of course, that didn’t happen. If it had, no one would even have known what happened that fateful night in my basement when I went toe-to-toe with frozen breakfast food and lost. The next morning, my mom called my doctor’s office and my orthopedic specialists’ offices and none of the doctors were in because of the holiday. Even the nurse practitioners were out. The whole team of medical professionals typically dispatched to put out whatever medical fire I’d started was down for the count. By that time, I had already amassed an entire practice of orthopedic doctors and surgeons – a father, his three sons, and a daughter-in-law – but not one of them was reachable. Apparently, MLK Jr. Day is a major holiday for medical practices. Instead, the receptionist unhelpfully referred us to another orthopedic surgeon in the same building who was actually open on this particular day. In baseball, it’s pretty typical to see a major league team use a lot of their minor league and farm-system players during spring training exhibition games. It’s a good way to see how well a club educates their players, if they’re getting the kind of conditioning and practice players of their level should, and if they mess up it’s a teachable moment that comes at no real loss to the professional team. When it comes to injuries, I am a major league game. They sent me the most recently drafted minor league player who hadn’t even been fitted for his uniform yet. I’m sure the doctor was perfectly nice. I vaguely remember an x-ray where he pointed out that my clavicle was clearly separated and it seemed as though my shoulder had indeed started to work its way back into the rotator cuff, but everything was slightly pinched. I don’t remember anything he did causing me any real pain, but I know he did do a little poking and prodding around. It was clear he didn’t really know what to do in this situation, but he was trying. But these things are not as clear to me as what happened next. After telling him my story, he seemed confused. He promptly asked my mother to leave the room for just a moment. Sure, why not. I’d already explained it to no less than twenty people that morning. What’s twenty-one? I explained the story for a third time and before he asked me if I was really sure that’s how everything happened. Then he let my mom back in, seemed a little disappointed, and then sent in one of the office girls to fit me for a sling. At sixteen, I didn’t understand what had just happened. It wasn’t until I was in the car with my mother on the way home that she explained she knew exactly what was on this doctor’s mind – he thought this was an elaborate story I made up to cover for being abused by my parents. This is what happens when you send the fifth-string players and the grounds crew to play in a major league game. 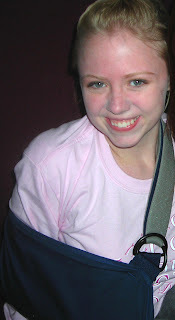 Of course what I went through the night of the injury and the day following was really nothing compared to the reaction I got the next day when I got to school in a sling with my dominant hand completely immobilized. In each class, I had take a note up to every teacher and show them that I was not supposed to use this arm – even for writing – for at least the next week and that I should take it easy for another two weeks after that. I needed someone in one of my classes to take notes for me. The day was especially long. Six times that day I had to tell this story in front of an entire class. Even though I went to a very tiny public high school where gossip was a life-sustaining force, people still asked me to tell them the story, even though I knew for a fact they’d heard it. I couldn’t operate my locker combination without help. By the end of the day, I’d given up. Three of my classes were in the same room, so I just kept all my stuff on an extra desk in that room and came and went from it throughout the day, with help of course. When it was time for lunch, for which my friends and I usually went off campus, they took great pleasure in helping me get my seat belt on and off. The crowning moment took place in my chemistry class, filled with all of the football players. My oldest and best friend at the happened to be a football player and the teacher was the football coach. I already got teased a lot. I wasn't particularly fond of chemistry as it was. I'd earned a reputation as being the most likely to set herself on fire. Then I had to go and walk in with what can only be described as sheer comedic gold. Eventually, the initial buzz wore down and I learned to cope and laugh at it like everyone else. I’d become pretty good at it. But this wasn’t an injury that could be lived down. Anytime for the rest of high school that someone saw me hurt, they would ask me something to the effect of “Did you go grocery shopping in the frozen foods section?” It followed me after high school, too. A handful of my friends from my graduating class and a few afterwards all went to a small college in Michigan. A couple went north to a larger public university. We all performed in spring musicals together while we'd been in high school. After graduation, these musicals became a sort of yearly reunion. The auditorium was our Jerusalem and all roads eventually led us back together at these events. A few years ago, I met a person who had gone to one of these schools with my friends. I’m not sure which of the two schools this person went to. I cannot for the life of me remember this person’s name. I can’t even remember their gender. But somehow, we all came to discover that we had mutual friends with whom I’d performed in musicals for several years. One show I mentioned was “Once Upon a Mattress” in which I played the Jester, which was memorable since the part was intended for a guy. But the part called for the Jester to dance a lot and trying to find a guy who could or would dance a lot for the part was not successful. “You are, aren’t you? You’re the girl that dislocated her shoulder getting the waffles. And then while you were the girl Jester, you broke your foot but didn’t know how, right?” I believe my answer was to nod and simply turn around. I wasn’t sure whether to be mortified or strangely intrigued by the fact that my fight with the waffles had spread to a school an hour or so away from where we all grew up. This is how myths and folklore spreads. I was officially part of the oral tradition. Me and the waffles. Both in the moment and over the years, I’ve looked back at the whole waffle-fiasco and thought to myself that it was really a situation where I could’ve used a boyfriend. It would’ve been much less humiliating to have a boy who really liked me to belt me into his car for three weeks or to take notes for me in chemistry. It would have been sweet to have a boy who would go to bat for me and defend my honor against the waffles. It would’ve been nice not having to worry who would carry my books. Hell, it would’ve been nice if I had a boyfriend who would spend time at my house with my parents and be familiar enough to go down to our basement and get the bag of bagels for me so I never had to tango with the waffles in the first place. This was most definitely a single girl problem. It's worth noting that in 2008, I underwent surgery for a minor rotator cuff tear to my right shoulder. When my surgeon opened me up, he found that my entire shoulder was stretched well beyond its natural limits and my whole arm was unstable. The cause of all this? A connective tissue disease that allows my joints to stretch but, just like when I was sixteen and facing the waffles, would not allow them to go back. In fact it looked a lot like my whole rotator cuff had been stuck somewhere between the socket of my rotator cuff and being dislocated for a very long time. They had to completely reconstruct my right shoulder and in late 2011, I had to have the procedure done again to shore up the first procedure, which was in danger of failing. If you're keeping track, that means that that for the better part of ten years, these waffles have not only caused me no small amount of humiliation, but actual great and severe personal injury. Those damn waffles are never, never far from my mind. It wasn’t the first time and it certainly wasn’t the last time I lamented my singledom. At sixteen, I’d only ever had one true boyfriend. In the past ten years since the waffles, I’ve only had one other boy of significance, which is to say that I felt single about 75% of the time anyhow. In truth, some of my most humiliating or difficult moments might have been made easier by having a boyfriend. But the majority of my funniest memories, even the ones associated with a little physical pain and a whole lot of teasing that continues to this day, come from those times when I didn’t have a boyfriend to rely on. I got through with my friends or my family and learned how to rely on myself in the process. It might not have always been smooth sailing, but I fully embrace my singledom and my hilarious single girl problems – at least most of the time. Now I’m not saying that relationships are a bad thing. I’d like one. But I’m headstrong and independent. My pace is not easy for boys to keep up with and I have yet to find the right one and the right time to force myself to slow down for – which is to say that the right boy may indeed have come along, but it may or may not have been at a time when I wasn’t ready for it and had no idea what I wanted in life, and flat out wasn't paying attention. At any length, I'm still ... waiting. I wouldn't say I'm exactly hunting. I'm content and I've got plans of my own and if a guy comes in, awesome. If not, that's fine, too. For me, significant others have been things that happen in between me living the rest of my life. And more than once a day, I’ll think to myself, this could be easier if I had a boyfriend. Honestly, I think that even once I’m not single anymore, I’ll still have those moments. I’m really, really independent, I don’t see a man being able to take that down, so consequently, I still think I’ll find myself in positions where I’m trying to figure out how to conquer a situation on my own because I put myself in a position where most girls would have made sure they had a dude at their side in the first place and I just charged in ahead on my own.